Jim Butcher is the #1 New York Times bestselling author of the Dresden Files, a modern-day fantasy about a wizard for hire in Chicago. The Dresden Files was made into a TV series in 2007 on the Syfy channel (then the Sci Fi channel). Jim is also the author of the Codex Alera, a more traditional fantasy series with swords and elemental creatures. Matthew Peterson: Hello everyone, and welcome back to The Author Hour: Your Guide to Fantastic Fiction. I’m your host, Matthew Peterson, best-selling author of the Parallel Worlds series, which can be found at www.Paraworlds.com. A lot of things have happened since my last show. First of, my debut science fantasy novel, Paraworld Zero, was published in India this month. Ironically I’m still in search for a new agent and publisher in the states. Arrgg. [laughs] And lastly the construction company is well on their way to finishing my house. Yea! It’s been over nine months since my house was destroyed in a fire, so it’ll be nice to get back to a normal life again. Well, that’s it for the announcements, let’s get to the interview. 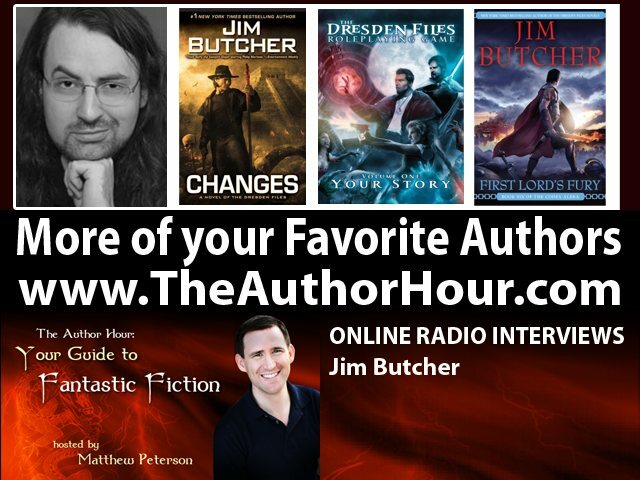 My guest today is Jim Butcher, the #1 New York Times best-selling author of the Dresden files. A modern day fantasy about a wizard for hire in Chicago. The Dresden files were made into a TV series a while ago on the Sci-Fi channel, which I must say I thoroughly enjoyed. Jim is also the author of the Codex Alera, a more traditional fantasy series with swords and elemental creatures. Thanks so much for being on the show today, Jim. Matthew Peterson: Let’s first talk about the Dresden Files. I understand the first book, Storm Front, came about because of something you were trying to prove to your writing instructor? Jim Butcher: Oh, yes. My writing teacher had been giving me very good advice for several years and I’d been ignoring her, especially the last couple on account of, you know, I had a degree in English literature, so you know, I knew what I was talking about. Whereas, she had merely published forty novels. Jim Butcher: So at one point we had argued about things, over and over. She’d been trying to help. So finally this one semester I said you know I’m just going to do everything she says this semester. I’m going to show her how wrong she is. I’m going to follow all the little rules. I’m going to fill in all the little work sheets and she’s going to see what terrible cookie-cutter crap comes out, you know, from that kind of writing processes. Jim Butcher: So I did that, and I wrote the first book of the Dresden files. Matthew Peterson: There you go! Jim Butcher: Which showed her. Yeah, yeah. Matthew Peterson: Yes, yes. Very nice. Well, you’ve got 12 now in the series and many of them have hit the New York Times Bestseller list. Your latest book is Changes. Tell us a little bit about that book. Jim Butcher: Changes starts off with Harry finding out that a woman he was involved with several years ago, and who he hasn’t seen in about 8 years, got pregnant the last time they were together and never told him about it. And so now he finds out that he has an 8-year-old daughter, and not only that, but the bad guys have abducted her and they’re going to use her to do something horrible. And so he’s got to head up and find some way to stop them to save his kid. Harry himself was an orphan from the time he was about 6 years old. So he has certain issues, you know, when it comes to children and about how . . . you know, he decided if he was ever a father they were never going to have no one to show up and protect them and help them. Jim Butcher: Harry has issues anyway, you know, in terms of trying to help out the little guy, in terms of this irrational streak of chivalry that he knows is going to get him killed one day. Then you throw in a daughter and all of his parent (or lack of parent) issues on top of that. And he’s in a completely irrational state of mind, you know, just as the entire war with the vampire courts is looking like it’s beginning to come to a diplomatic end, this happens, and he’s going to have to go against his own people to get his daughter back. Matthew Peterson: . . . you know with the vampires and all the different sets of people. This is a world, isn’t it, where the fantastical is a little bit more common place? A lot of people do know about these things. Right now we have a lot of things like Twilight and whatnot where only a select group of humans actually know about the other people. How is your world compared to that? Jim Butcher: Oh, well, in The Dresden Files, the supernatural that goes on . . . I mean as long as you don’t show up on the 6 o’clock news in a live interview, you know, and changed into a werewolf or something, you really don’t have to go very far to hide it from people. Jim Butcher: Kind of the conceit of the books is that humanity in general, we’re kind of dumb, and we really don’t want to believe in that sort of thing, and so, you know, if you give us any excuse whatsoever, we won’t. Matthew Peterson: Yeah. Harry kind of hides it, but yet he doesn’t. I mean, he’s a wizard for hire. [laughs] He’s got a Yellow Book listing. Jim Butcher: Yeah, he’s in the phone book under “Wizard” and everybody just assumes that he’s either a magician that shows up at parties or that this is just his “schtick” to sell his services. Jim Butcher: In an industry where you’ve gotta have something to make a living. It’s not easy to make a living as a private eye. Matthew Peterson: Yeah, yeah. I had never heard of The Dresden Files until it was made into a TV series. So I hadn’t read the books or anything. I saw this TV series and I watched every single one of them. They were really great; I enjoyed them a lot. Jim Butcher: Yeah. They were neat. Matthew Peterson: Really upset that they quit the series . . .
Matthew Peterson: . . . right at the get go there. Jim Butcher: There are still fans of the series that are writing letters to Syfy (Sci-Fi) and holding events, you know virtual events and so on, trying to convince them to get the show back on. Matthew Peterson: Yeah. It was great. It was great. Matthew Peterson: What were your impressions on the TV series? Jim Butcher: Oh, it was neat. I actually got to be on an episode. You know, one of my personal heroes is Stan Lee. Jim Butcher: And Stan Lee show up in all of his comic book movies--just in little bits in there. So I got in touch with the producer and asked him, “Hey, could I just show up and as a back ground role, could I walk by at the café or something like that?” And he thought that’d be a great idea, so I got to show up and be an assistant. Jim Butcher: Yeah, it was cool, ‘cause the neat part was I get on the show and there’s Murphy and there’s Harry and there’s Butters and they’re talking about what’s going on and everyone else could see them too! Jim Butcher: That was kind of a new experience for me. I know exactly what everything looks like in my head, but it was more of a shared thing up there. Matthew Peterson: Yeah. And of course, they have to make changes when they do an adaptation, and sometimes they add new characters or change the events around a little bit. Matthew Peterson: I enjoyed it. Do you foresee maybe a movie in the future or maybe something else--a different spin off? Jim Butcher: Um . . . you know, I don’t know. Although, I tell you right now, I think what I would most like to see would be like a massive multi-player online game. Jim Butcher: That would be cool. Matthew Peterson: Now you do have an RPG game, don’t you, for The Dresden Files? Jim Butcher: There is indeed. There’s a role playing game for The Dresden Files produced by Evil Hat. It will be coming out this late summer or early fall. Jim Butcher: You know, it’s based on the Fudge [Fate] role playing system designed by Fred Hicks, which has won several awards at game conventions and so on. And there’s a whole lot of excitement about it. And I think I might be the thing that’s holding it up right now. I need to get a little bit of original material written for it. Matthew Peterson: Yeah. I think I met you once at the Arizona Book Festival several years ago. Just almost in passing. And I remember you were mentioning that you were going to be writing quite a few books in this series. At least that’s what your plans were. How many books do you plan on writing? Jim Butcher: When I sat down to do it as a class project, ‘cause originally the first book was an assignment in my Writing a Novel class, I planned out about 20 of the case books like we’ve seen so far. Matthew Peterson: [laughs] Well, you’re on your way! Jim Butcher: I was too dumb to know that the odds against something like that happening were so enormous. You know, really I owe a lot to my own stupidity. I was too dumb to know how unlikely it was, so I went and did it. Matthew Peterson: Well, you’re half way done with that . . . over half way done with that goal. Jim Butcher: Yeah, I think I overestimated how tightly packed I’d be able to make the books. I might have to do a little bit... I’m saying “20-ish” at this point. Jim Butcher: You know, 20-ish novels; it might go a little bit longer. Matthew Peterson: Yeah, he might be a grandfather by the time they end. [laughs] So you actually did start another series as well, or actually you completed another series: The Codex Alera? Matthew Peterson: And that one happened, you know, about midstream while you were writing The Dresden Files. You decided to pick up another series and start writing that one? Jim Butcher: Yes, yes. I wanted to be able to actually make a living for my family. Jim Butcher: And one book a year won’t do that for ya. If you’re, you know, when your selling the way that the first several Dresden Files books did. It’ll get you Ramen Noodles and an apartment, that’s about it. Matthew Peterson: [laughs] Yeah. And the Codex Alera, I’m not very familiar with that series. What is the main storyline of that series? 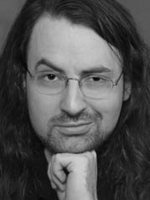 Jim Butcher: The main storyline of the Codex Alera is intentionally almost exactly the opposite of that of the Dresden Files. You know, my central character, his name is Tavi, and Tavi is the only person in his world who can’t use magic. The entire world and society there in Alera is based around the concept of Furies. They’re these kind of elemental spirits that live in the rocks and the streams and the sky and so on. And your relationship to them, your Fury crafting, is really what determines a lot about where you are in that society. He’s the only one who has absolutely none. And as a result, he’s had to get by his whole life on his wits and thinking around problems and applying his strengths to things, rather than just solving it the simple way. So the poor guy... I mean, it would be as if you and I had walked into the room and we couldn’t turn on the TV or use the remote or turn on the lights or turn the faucet or anything like that. Jim Butcher: You know, that’s kind of his life. Jim Butcher: So he starts off as a boy on the farm in the middle of nowhere, ‘cause that’s where fantasy begins. I didn’t make that rule. You know, you’re trying to write an epic fantasy, though, you can usually find him. Where’s it gonna start? Boy on a farm. Matthew Peterson: [laughs] Boy on a farm. Jim Butcher: You know, there’s Frodo right under the trees. Matthew Peterson: [laughs] Yep, yep. And that series is completed isn’t it? You’ve got six books? Six books there? Jim Butcher: Yes, it is. Yeah, it was a six book series and the fans of the series are now, “Oh, when are you going to go back?” It’s like, “I don’t know.” I think it might be interesting to go back and write the story that takes place a couple hundred years later after all the changes to their world that happened because of the heroes of the book. But we’ll see. We’ll see. Matthew Peterson: Yeah. Very nice. Well, what are you plans in the future? I know, definitely more Dresden Files books. Anything else in the pipeline? Jim Butcher: Yeah, more Dresden Files books. Right now just a couple of days ago I finished the last of the material for Side Jobs, which is the Dresden Files short story collection. It’s a collection of almost all the short stories that have been published in the Dresden Files, plus some new material that I wrote. And that’ll be out this fall. I’m working on book 13 of the Dresden Files right now, which is, normally I’ve had to stop and do another book and then go back to the Dresden Files, but this year it’s been straight Dresden all the way through. And then later this year, I’m probably going to be writing a book with another author. A friend of mine, Cam Banks, who I think he’s the only person I’ve ever met who could actually put up with me long enough to write a book with me. Matthew Peterson: [laughs] And there is like a graphic novel, right, that’s coming out? Jim Butcher: Well, there is an original graphic novel story called Welcome to the Jungle that was produced by Dabel Brothers. Then they’ve produced the first half of Storm Front as a graphic novel. And then right now we’re working on the second half of Storm Front. We changed publishers, but it’s most of the same people, but we changed which company they’re . . . you know, actually owns it, so now I’m working with Dynamite. Jim Butcher: So now we’re going to get the second part of Storm Front out. Matthew Peterson: Very nice. And so you’ve got the 12 books and Changes just came out and you’re on tour right now. Is there anything you can tell us about the 13th book, just to wet our whistle, I guess? Jim Butcher: Um . . . no I can’t, except that I hope that people, when I’m tour, I hope that the folks who have actually got to read all the way through Changes, let me live long enough to finish 13. Jim Butcher: We’ll have to see. Matthew Peterson: Harry’ll be in it. We know that. Matthew Peterson: [laughs] That’s a given. Well, great. Well, it’s been great talking with you, Jim. Jim Butcher: Oh, no problem. Matthew Peterson: I’ve been speaking with Jim Butcher, the #1 New York Times bestselling author of the Dresden Files and the Codex Alera series. Thanks again for being on the show today, Jim. Jim Butcher: You’re very welcome. Matthew Peterson: Well that’s it for today. Please go to www.TheAuthorHour.com to catch the bonus questions that didn’t air on the show. If you want to meet Jim Butcher in person, he’ll be at the Mysterious Galaxy bookstore in San Diego tomorrow, April 9th , then on the 10th, he’ll be at Barnes and Noble in Huntington Beach and then on the 12th he’ll be at Borders Bookstore in Lee’s Summit, Missouri. I hope you enjoyed the show today. If you’d like to listen to more great interviews of your favorite authors, just visit TheAuthorHour.com. Have a great day everyone.